This smaller, more cost-effective dehydrator involves a patented air flow system.Â It heats food evenly through an exterior pressurized chamber. 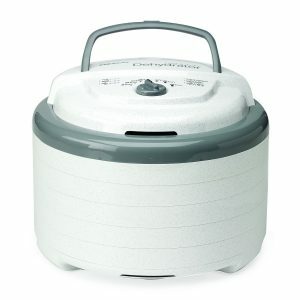 Add to that a stylish look, and this miniature food dehydrator may just be the best bang for your buck. Itâ€™s no wonder the Nesco FD-75A Snackmaster Pro is listed as Amazonâ€™s number one best-selling food dehydrator. Reviews for this product are overwhelmingly positive. They range from great style and usability to smooth heating and cleaning.Â The Nesco FD-75A Snackmaster Pro has approvals for just about every aspect of its machinery. 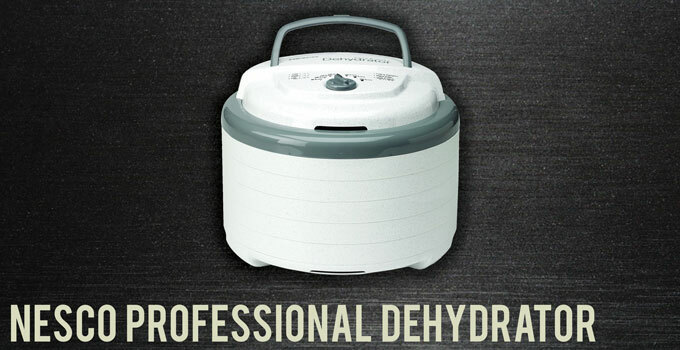 Positive reviews of the dehydrator agree that it is simply a solid product overall. They highlight its patented drying system, relatively strong power for its compact size, and various convenient features. Multiple dehydrator reviews praise the high quality of the food its churns out.Â This is especially true when it comes to meat and fruit.Â Additionally, an unexpected plus is that the machine functions well in both arid and humid environments. Alternatively, negative dehydrator reviews for this model are few and far between. Rather than critiquing the main features, the few complaints claim that the product they purchased stopped functioning after a limited amount of use. This type of issue is most likely attributed to rare errors in production.Â Buyers can replace these products after they set up a Warranty Service account on the Nesco website. With an impressive 4.5 out of 5 stars from more than 4,000 customer reviews, the Nesco FD-75A Snackmaster Pro is highly regarded by a majority of its purchasers. What Does the Nesco FD-75A Snackmaster Pro Come With? Unlike many devices, this food dehydrator and all of its individual components are homegrown and manufactured entirely in the United States. Therefore, the products are less susceptible to international shipping damage.Â In addition, older parts undergoing standard wear and tear can be readily replaced. A small fan is the driving force behind this dehydratorâ€™s drying power. The technique it uses is described as Coverga-Flow technology which is a unique strategy for turning out tasty dried goods. Apart from its distinctive drying mechanism, this food dehydrator includes a modifiable thermostat that can provide steady heat at temperatures of 95Âº to 160Âº F.Â The trays are suitable to this range of heat temperatures since they are made out of BPA-free, food-grade plastic. The machineâ€™s opaque Vita-Save exterior also helps block harmful light from destroying the nutritional content of food while inside the machine. As if this was not enough, the package includes a recipe book, fruit rolling sheets, and jerky spice packets to help newcomers get started. On the negative side, the dehydrator does not have a built-in timer, so keep one handy when you have it running. Pumping 600 watts of drying power, the most updated version of the Nesco Snackmaster Pro food dehydrator is fully equipped for high quality dehydration. It uses the companyâ€™s patented Coverga-Flow technology to force air down an exterior pressurized chamber and then horizontally across every single drying tray. This method allows each area within the machine to dry evenly.Â Many other dehydrators that send the heat directly through the trays have to deal with heat blockage. Even heating across individual trays assures well-dried food in a timely fashion. Ultimately, this leads to two primary benefits: good food and convenient drying. Practically speaking, these perks mean that users have no reason to worry about flavors of different types of food that sit on different trays crossing paths. Uneven heating systems found in some other dehydrators can result in foods with an inconsistent texture.Â They may also require users to open the dehydrate and manually rotate trays during the drying process. How Large is the Nesco FD-75A Snackmaster Pro? Operating on the smaller side, as far as food dehydrators go, the Nesco FD-75A Snackmaster Pro is a medium compact device. It can easily fit on a kitchen countertop, but is not quite as small as other miniature electric food dehydrators. Its precise dimensions are 22.13 by 13.75 by 13.87 inches and weighs approximately 9 pounds.Â Individual tray dimensions are 3 by 13 by 13 inches. However, for people who have a bit more room to spare, the dehydrator can be expanded from a 5-tray to a 12-tray system. Adding this extension doubles its height while keeping its width the same. Another advantage of this smaller dehydrating unit is that it stays relatively quiet when itâ€™s running. The fanâ€™s humming is minimally disruptive such that the dehydrator can be left on all night. Another nice touch is the marble white or speckled gray color options which give it a clean look. All in all, the design of this machine likely suits people who plan on using it in all types kitchens. Any product that boasts higher sales than its peers is likely a worthwhile purchase. The Nesco FD-75A Snackmaster Pro is not only Amazonâ€™s choice for â€œdehydrator,â€ but has thousands of positive dehydrator reviews as well. Of note, this commercial dehydrator is not as powerful as many larger and higher class machines. So, if youâ€™re searching for a top-of-the-line, large-scale meat dehydrator, you might not want to go for this one. However, this model is unmatched for the quality it offers at the price point listed. To wrap it all up, the sleek design, compact size, high-tech airflow system, and collection of free add-ons make this dehydrator a solid option for everyday food dehydration aficionados.Â Its customer reviews are great, its sales are high, and it has a very affordable price. To that end, the Nesco FD-75A Snackmaster Pro garners a well-deserved 9 out of 10 ranking.